I love Trader Joe’s. If you are lucky enough to have one near you, I am certain you know why. Where else can you buy organic for the price of supermarket conventional produce? It is an all around win at TJ’s although with that being said, you do need to be careful of the frozen, packaged meals. Monstrous sodium. But all in all, the sprouted bread, quinoa, organic peppers. Score. Oh and they give out shot glass-sized coffee samples. :). This recipe was slightly modified from Cooking With Trader Joe’s, Skinny Dish! 1) Heat oil in a large skillet. 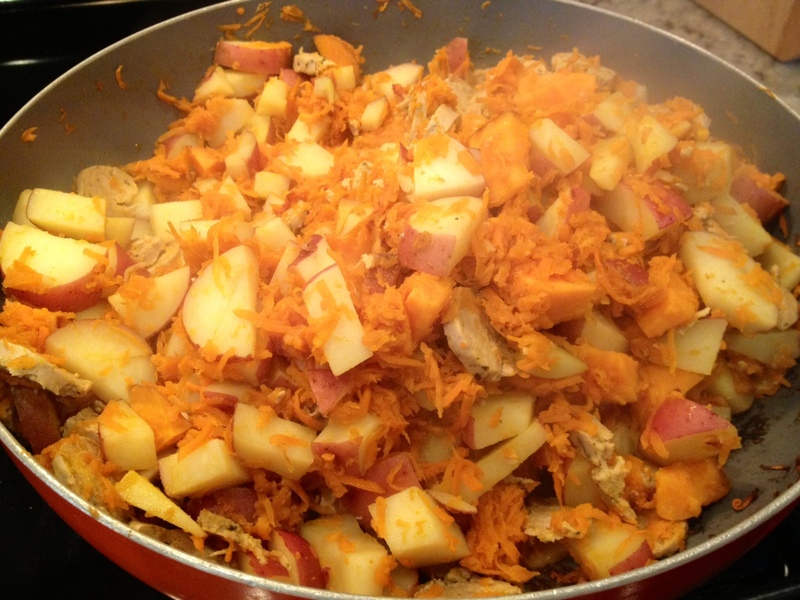 Add potatoes and carrots, and cook, covered, until the potatoes start to brown. About 5 minutes. 2) Add Veggie broth and diced veggie sausages. 3) Continue to cook, stirring occasionally, until potatoes are soft. 4) Serve hot by itself, or with salsa, Sriracha, Vegan sour cream! Sky is the limit! Vegetarian Enchilada Bake- Perfect for someone that thinks they can’t have a meatless meal. Ha! This was one of the very first vegetarian recipes that I made for my family. 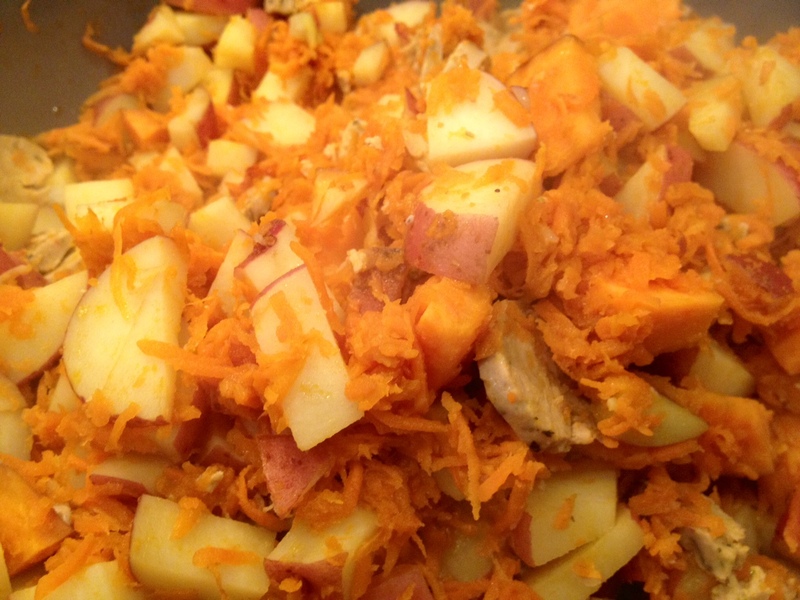 This recipe is adapted from the PETA organization and isn’t the healthiest recipe on the planet, but it will suffice. I am a big fan of “transition meals” aka fake meats that make it easier for people to try and live meat free. This is a great transition meal and is a thumbs up for all ages. 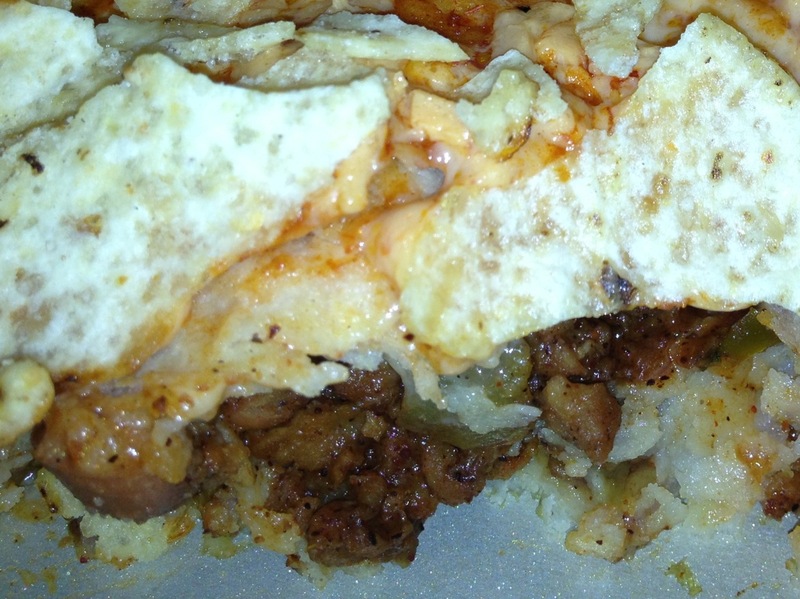 • In a small bowl, combine the burger crumbles and taco seasoning and set aside. • Spray a 9-inch by 13-inch pan with oil. • In layers, spread a generous amount of enchilada sauce, 6 corn tortillas, 1 cans of pinto beans, a handful of green onion, a third of the shredded “cheese,” half the can of green chilies, lots more enchilada sauce, 6 more tortillas, all the seasoned burger crumbles, another third of the “cheese,” the remaining green chilies, more enchilada sauce, then the final 6 tortillas, more enchilada sauce, and the rest of the “cheese.” Cover in foil and bake for 30 minutes. • Remove the foil, top the entire casserole with the crushed tortilla chips, and bake for another 15 to 30 minutes or until bubbly and browned.